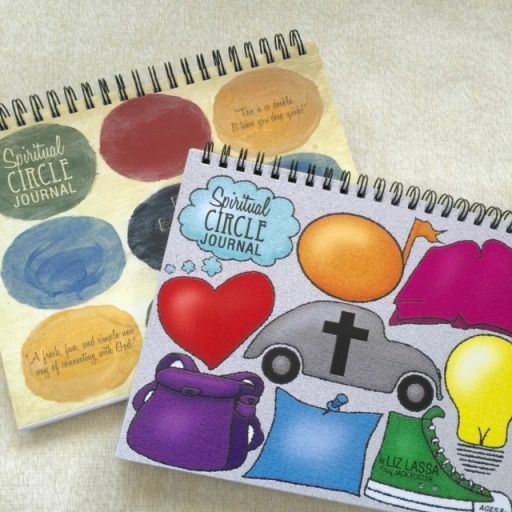 When I first saw the Spiritual Circle Journal for Kids & Teens it reminded me of me. See, when I sit in church, I have a lot of thoughts during the sermon, and while we do go to an Assemblies of God church and I could, feasibly, just stand up and start talking in the middle of the pastor’s message, it’s not one of my goals to cause a major disruption with my comments/questions. So what do I do to keep quiet? 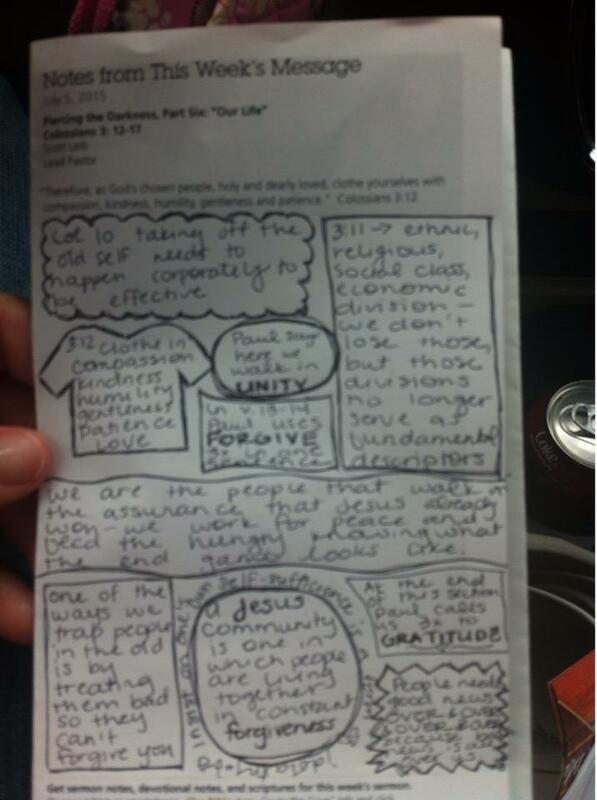 I make my sermon notes pretty. Sometimes I draw shapes. Actual sermon notes from July 2015. True story. PS- if you’re ever in class with me, you want to get my notes, not someone else’s. They’re fantastic notes and they’re usually color-coded. Taking notes and using shapes helps me keep quiet, but it also helps me to organize my thoughts, and it helps me to remember important things. 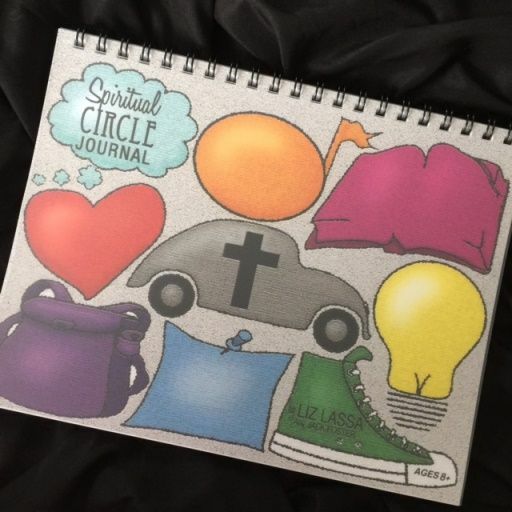 The Spiritual Circle Journal helps you do the same thing- organize your thoughts and questions using shapes and colors to help guide your reflection process. My middle son used this journal and he really enjoyed it. However, he asked me not to share any of his pages because his thoughts in journals are private, and I can appreciate that sentiment, so you won’t see any here, but I will explain how the journal works. The idea is that by using this journal to respond to daily devotional Bible reading in a set way so that over time, your children learn how to use that time for their benefit and not just as a check box on their list of things to do. By guiding them to think about how their daily reading relates to other things (for example, what is a song this reminds me of?) it helps them to make connections from their reading to the rest of their lives. One neat thing that I noticed about using this journal was that thinking critically and really engaging in his devotion reading was that he extended it to his schoolwork reading, too. His brain really started to analyze connections between his language arts reading and outside sources, things he knew from history/science, and even pop culture references. That was certainly an unexpected bonus! I liked the organizational structure of this journal, and so did Logan, although his chief complaint was that it didn’t “feel” journal-y. To understand that, you need to know that Logan really likes serious journals (he got that from me)- leather-bound, embossed, special feeling journals- so the spiral bound book didn’t give him that. However, I don’t think that’s really a necessary thing as far as content goes!